This review is being left up for archive purposes, but Ari's Greek Restaurant closed after 6 years in the Spring of 2011. This location became a pawn shop in 2013. 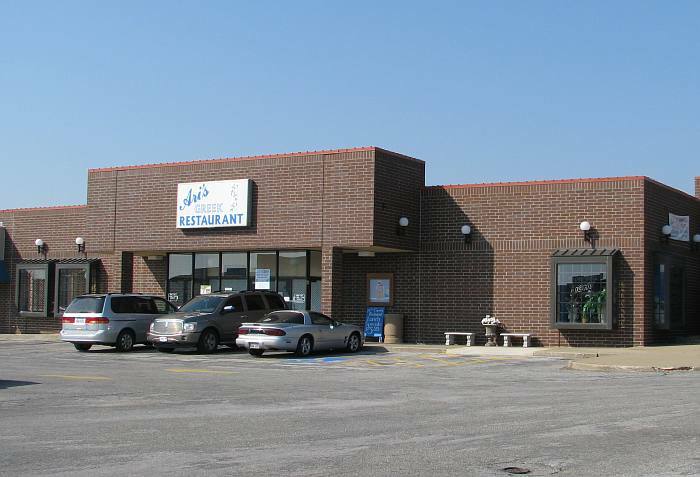 Ari's Greek Restaurant opened in Olathe, Kansas in 2006, and is the only Greek restaurant in the Olathe area. Ari's may be the best place to get seafood in Olathe. Superior seafood dishes include Mediterranean style jambalaya with baby clams, mussels, shrimp, chicken, sausage, spices served over rice; Seafarer's Combo with shrimp, mussels, and slices of sausage sautéed in olive oil with garlic and tomatoes tossed with pasta; and a wonderful octopus appetizer of sautéed octopus served with lemon wedges & pita bread. In September, Ari's Greek Restaurant added a Greek influenced Seafood buffet 6-9PM Friday nights. My favorite item is only available on the buffet: Spicy Calamari (calamari with diced tomatoes and pepperoncini sautéed in tomato sauce). The Seafood buffet is $21.95 and includes salmon, roast beef, calamari, mussels, and snow crab. Ari's Greek Restaurant accepts and recommends reservations. They are closed Sundays.